With the cool but not yet deeply frigid weather, it's time to dip into my foot-high stack of felt berets and find a jaunty angle. The beret is the perfect intersection of practicality and style: you can tuck it in a bag, and it emerges intact. You can buy a new colour for less than $20 or splurge with studs, sequins or cashmere. Pulled over the ears, it stops sharp wind, but on a clement day, pushed to the back of the head, it's barely there. Mine are wool felt; blogger and expert knitter materfamilias creates a luscious soft wool model that friends beg for. Like a well-cut black V-neck, the beret's neither in nor out of style, just indispensable. And for some reason, perhaps only wishful thinking, berets impart less hat head. An embellished beret, like the gray model at left, elevates a simple dress and boots. One of my favourites is deep purplish blue with gold nailhead studs, from the hat salon at Holt Renfrew. I like a brooch on a beret, an effect I saw several times in Paris. If that's how I feel about berets, guess how I feel about men in them! I beg Le Duc to wear his Basque beret, and he occasionally obliges, though he prefers fedoras.If you doubt, pause to admire, strictly for sartorial edification, Alain Delon in "Doucement les Basses". A cat in a hat? If a beret, mignonne! I bought a red beret when I was in London and I was 18. 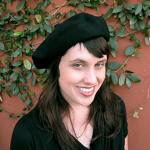 That was many years ago, but the feeling of how chic and fab I felt in the beret stays with me. Sadly, I dumped the beret in one of my purges. J'adore the beret on the cat. Cutest thing I have seen today. I love how berets look, but sadly I've never found one to fit my tiny little head. Tuesday night I swooned over a leopard print version at the Ralph Lauren store. If it had been a few centimeters smaller, I'd have bought it. All cats should wear berets. How stylish. Thanks for the kind mention. I'm a beret-lover as well -- the last few years I've begun wearing hats very consistently through the winter and berets are a staple especially for the reasons you mention -- they look great on and they take up no space tucked in a purse where the squishing doesn't wreck their look at all. Wonder hats! I think all men should wear berets! I love them, but the wool ones itch me no end! I need acryl! Karen: I've seen gorgeous cotton knit berets and harder to find linen knit. Mine are mostly felted wool which doesn't itch (on me, anyway). I'd avoid acrylic as it does not retain shape well and tends to pill. wendy: How long do you think it stays on? Rita: A definite improvement on baseball caps! my aunt wears berets all the time, with great elegance and elan. while i was in paris i bought her three berets in a lovely wool felt -- one in black, one in cranberry, and one in navy. the really nice thing about these was that they were all embellished with additional felt cut outs -- feathers, leaves and a geometric design (very mondrian). they were slightly larger than the berets she buys here, and now the weather has turned cold enough in NYC for her to wear them. i can't wear them, as i always look as if i have some sort of growth... they just never sit right. still, viva la beret! My daughter looks really cute in a beret. I look really dumb in any hat. My dad always looked so sharp in his fedoras. Bérets are the only hats I look good in, and they mustn't be too small and flat "military looking" whether in the right-wing paramilitary incarnation or the left-wing chanelling Che one. I have a lovely angora béret that is soft, sleek fur like my black cat Renzo's. I dearly love it, ride my old-fashioned Raleigh bicycle in it, can wear it on most winter days except the most frigid. I'd be ashamed to tell this blog or Linda Grant's Thoughtful Dresser what I'd worn as temps fell below -25c - a fleece hoodie that is a cross between hijab and an overaged version of anarchist Black Bloc wear. But that was a matter of survival, not style. And hopefully nobody could recognise me anyway. I saw someone wearing a cranberry or maroon version of my angora béret, and want one. When I bought the black one, there was a red one, but it was too hard and strong a red to look quite right. Unlike the angora béret, which everyone, even non fashionistas, thinks I look smashing in. I have a wine-red béret in plain wool, also large and soft enough - unlike Déjà Pseu, I have a large head and a crop of thick, curly hair, now in a sort of curly bob - but better for rainy days when it isn't too cold. Indeed I find that doesn't muss my hair. On the contrary, in the rain, it keeps my hair from turning into a ball of frizz, without flattening it down too much. Unlike the "Mohair bérets", Polish traditionalist Catholic ladies who are notorious for imposing their morality on others. The sarcastic name comes from the different coloured bérets in different corps of the Polish army (and many other armies). Those are those knit bérets one often sees elderly ladies wearing on the bus. Must make it clear I'm not slagging anyone, just looking at an interesting phrase invoving bérets. And what colour béret should my cat wear? He is a black cat with a bit of white - white toes, whiskers and little V in front. Very dapper fellow. lagatta: touched by beret lovers' ardent descriptions. At -20 I, just worry about being warm! I too have a big head and if I'm buying a wool felt beret sometimes have to go through a stack to find the largest hole. I know what you mean about the right red, one of my friends calls it "a kind red". Your cat can wear any colour, as he will see it as black or gray anyway, but be careful of angora, wb/c of the rabbit content. He may wonder why he is wearing a bunny.